YES! I did it! 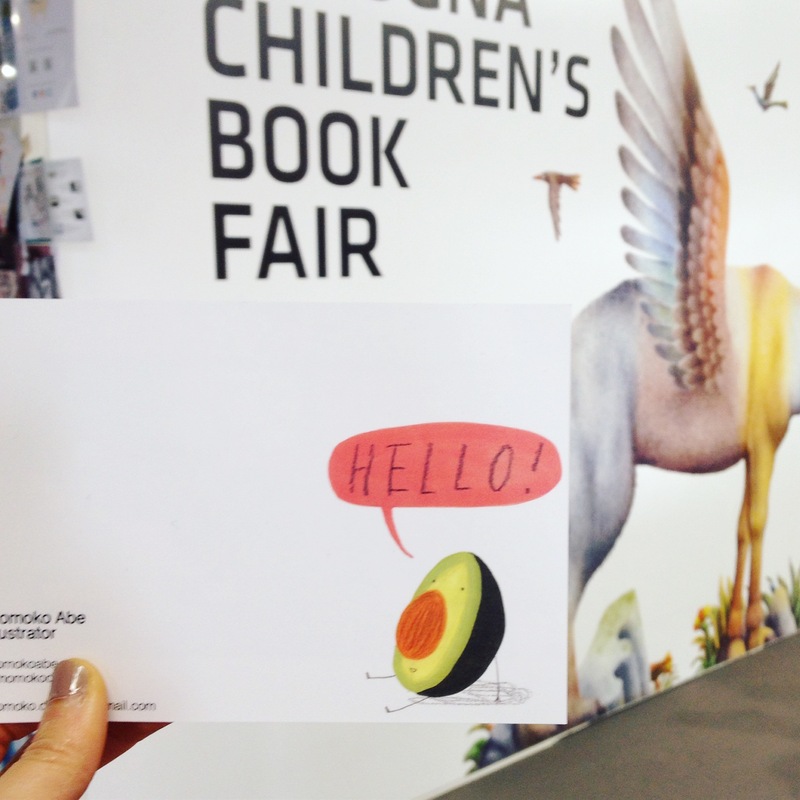 I went to the Bologna Children’s Book Fair, which was on my bucket list! I almost gave the great experience a miss though… Since I was (and still am) very indecisive and I’d heard some discouraging things about the fair before, I couldn’t make up my mind until my friends encouraged me to come with them. Now I’m so glad that they did (thanks, Sibba, Qian and Tina)! Before the fair, I googled and asked around my friends (BCBF veterans) for tips. Their tips proved to be valuable and made my experience at the fair priceless. So here, to pay forward, I’m sharing some tips I’ve gathered from the online*, my friends (including ever kind Mark Chambers who were also visiting the fair to promote his new book) and my own experience at the fair. Submit your artwork to the Illustrators Exhibition. If you get selected, it’s fantastic because it’s one of the greatest opportunities for new artists. Even if you don’t get selected (like me), you will get a free admission to the BCBF valid for the entire duration of it just by submitting your artwork. During the fair, the town of Bologna becomes very busy so book your accommodation as soon as possible. Some publishers sell their books at the fair and there are sooooo many beautiful books from all around the world. You’re crazy if you don’t get tempted to buy everything and bankrupt yourself. So make sure you have enough free space in your suitcase for those treasures. Also, try to stay until the last day of the fair if possible. Some publishers sell off their books (even the ones for the display) on the last day. You’ve got to be quick though as they tend to have only a few copies of each. I bought ¡Buen viaje, bebe! by Beatrice Alemagna (A buen paso 2015), Eccoti qua! by Mirjana Farkas (orecchio acerbo 2014) and Vazio (Empty) by Catarinaa Sobral (Pato Logico 2014). With hundreds stands, exhibitions and workshops & talks across 6 huge halls, I was almost non-stop, walking and standing all day. I brought a sketch book and drawing materials but I hardly had a time to stop and doodle! So comfy shoes are must! The food at the fair is pricy and the queues are long most of the time and the quality isn’t worth the price and your precious time. So bring your own food if possible. Note: There are some food places outside the venue but the free admission ticket won’t allow you to re-entre the fair. There are so many places you can distribute your promo materials like business cards and postcards at the BCBF. The most popular place is the Illustrators’ Wall. Don’t forget to bring sticky tape/push pins/blutak (like I did…). I put up some of my postcards, but, unless it’s a poster, people will keep taking your cards off the wall. So make sure to top up daily. Some publishers have a box for you to put your cards at their stands. If they don’t, you should ask their receptionists/representatives if you can leave your cards with them to pass on to their art directors. Also, some of the art directors/editors I was lucky to meet at the fair asked for my cards to keep as a reminder. UPDATE: For my second BCBF, I decided to put up posters instead of business cards and postcards. For more details, read my BCBF guide part two. Some masterclasses and workshops require you to sign up on the day. But I found most of them let everyone in anyway… However, the portfolio reviews are definitely something you need to sign up for and they are very popular. To secure a session, you should arrive at the fair very early. I got there at 9 one morning and there was a long queue already and I queued for about 30-40 minutes. I couldn’t get a session with a particular art director I wanted to see, but I managed to get a slot for the open review. I sent out hundreds(ish) of emails but couldn’t arrange any meeting with publishers beforehand, but I managed to meet quite a few publishers by visiting their stands in person during the fair. Most likely their schedules are booked up even before the fair. However, there is a slight chance that they have a few spare slots up for grab. Even if you don’t manage to book an appointment, don’t despair. Some publishers kindly spare their 5 minutes between meetings if you wait patiently and ask politely. Definitely patience is a virtue at the BCBF. I got to show my portfolio and book ideas to three publishers by queueing up for their open portfolio reviews. Try to queue early if possible. Publishers tend to spend more time with you at the beginning (it gets less and less towards the end of line). Also, one evening I talked to a gentleman at a bar packed with people from children’s book publishing, then he turned out to be an art director of a UK publisher and he kindly gave me his contact details! So don’t be shy. Talk, talk, talk! Even if you don’t get to meet any publishers, I personally think the BCBF is worth visiting. Like the London Book Fair, it’s a great place for your market research (the BCBF’s much better than the LBF as it’s much bigger and focused on children’s books). And those workshops, talks and exhibitions are inspiring. Also, there are many interesting events in the town too. For example, my friends and I went to Beatrice Alemagna’s small yet priceless exhibition in a cafe in one evening. IF the fair isn’t enough to satisfy your appetite for children’s books, visit this lovely children’s bookshop in Palazzo Re Enzo in the town centre. My BCBF experience wouldn’t have been this much successful and enjoyable without my friends, peers and mentors. The fair was huge. Two eyes, two ears and two legs weren’t enough. My friends and I were constantly exchanging informations on phones and tablets (“Just saw a queue for open review at S&S. Come! Quick!”, “A Russian publisher is looking for illustrators!” Etc etc). Meeting new people was definitely one of the best parts of my BCBF experience. Thanks to my friends and mentors, I met other lovely illustrators and publishers. Actually, I owe my best meetings with my favourite publishers to my generous friend Qian who knew those publishers. Lastly, here are things I brought to the fair everyday. Thank you very much for all these helpful tips, I will be attending this year the fair for the first time and it is perfect to have this information before going there. Will you be there this year too? I would like to ask you how many business cards and postcards do you recommend bringing. Thank you again and have a lovely day. Good luck with your preparation and days at the fair!